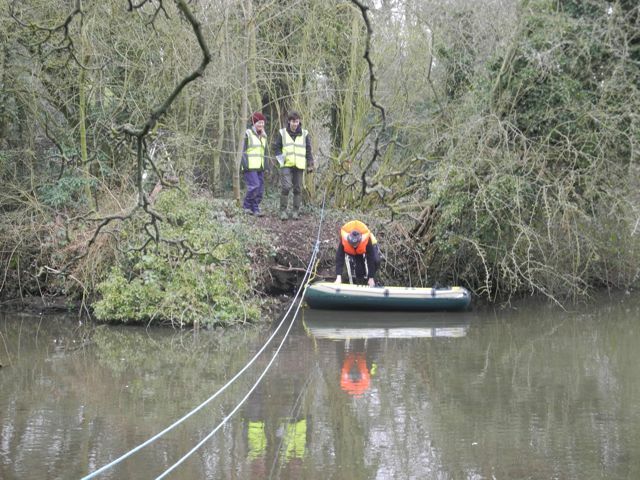 By the end of February survey work around the Lake had been completed and the plan drawn up. It then became a race against time to get detailed plans drawn of the area known as Mesopotamia, to the east of the great dam and the slopes below the East Terrace. 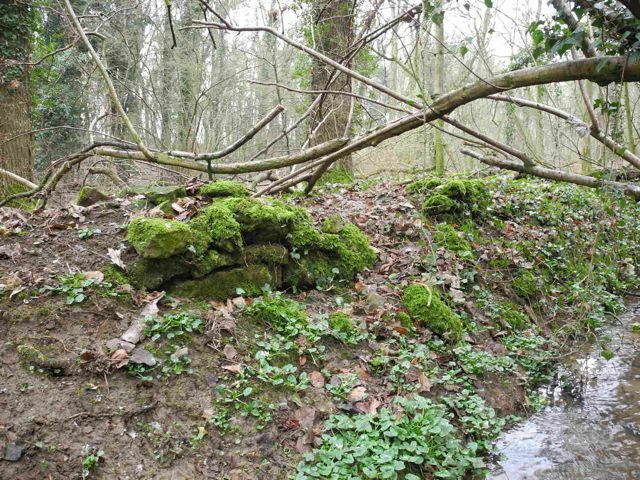 It was obvious that both these areas would become heavily overgrown as spring wore on and I didn't want to cause too much damage to the emerging vegetation. As I'm largely working alone at the moment a certain amount of ingenuity is going into setting things up for the survey work. Essentially what I've had to do is to set out a grid across the area using a series of tape measures: a couple of 100s, a 50 and two 30 metre tapes. With the aid of the trusty 3,4,5 triangle I can lay out a fairly accurate grid tied in to the overall series of fixed points and then start drawing in the extraordinarily complex series of earthworks. Surveying in Mesopotamia, triangles then squares. I'm continually walking round the site, just to keep in touch with what's going on, and I'm continually stumbling, literally in some cases, over new features. 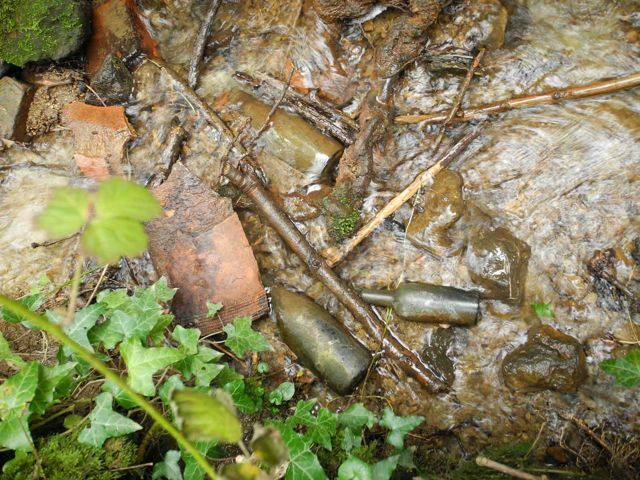 Down in the Fourth Fishpond I came across a short stretch of coursed walling, kind of in the middle of nowhere, and whilst looking into the chasm above the Cascade my attention was caught by a whole load of old bottles lying in the water. What are they doing there? Another mossy wall and bottles, bottles, bottles. Hopefully one bunch of people who may be able to help with some of the answers are the members of the Feldon Archaeological Society. 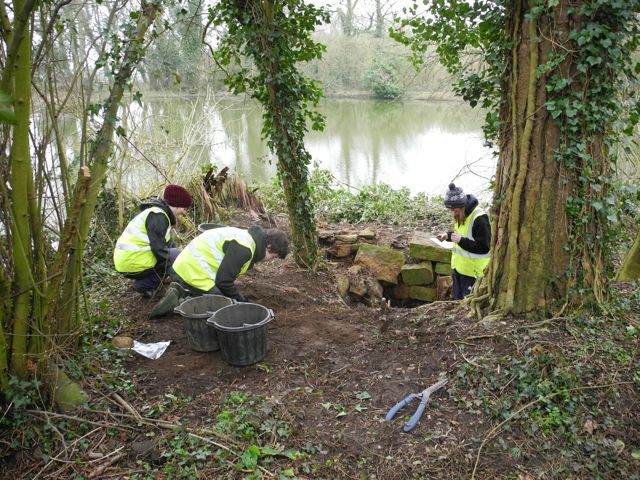 On Friday March 1st I was able to show Peter and Mike from the society round the park in the hope that some of their members will feel inspired to volunteer their time to the project. 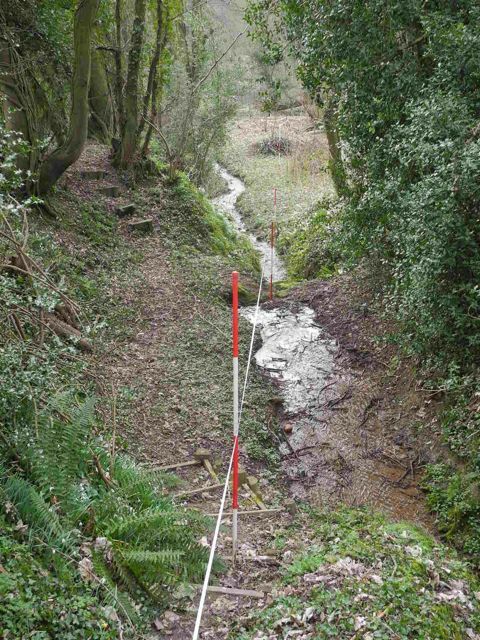 Work through the middle of March continued to concentrate on surveying the increasingly complex looking earthworks below the great dam. 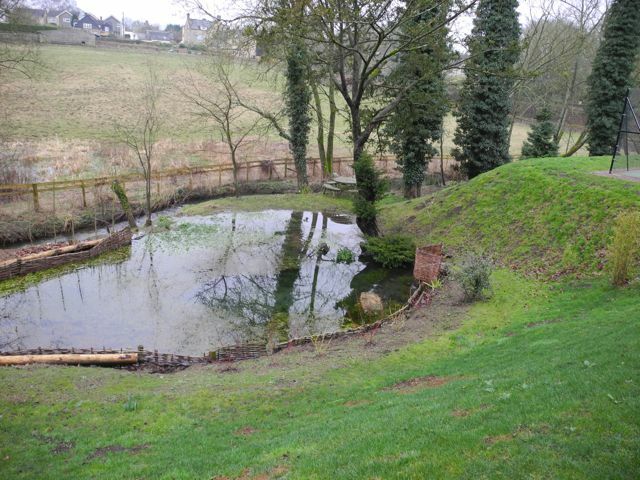 The big challenge will be try and assign periods to the different phases of earthwork and then by subtracting the later elements attempt to reconstruct the seventeenth-century arrangements. I was also able to make what I'm sure will be the first of many trips to the site of the Enstone Marvels before an extremely nasty cold got the better of me. View looking south-west across the possible site of the Enstone Marvels. 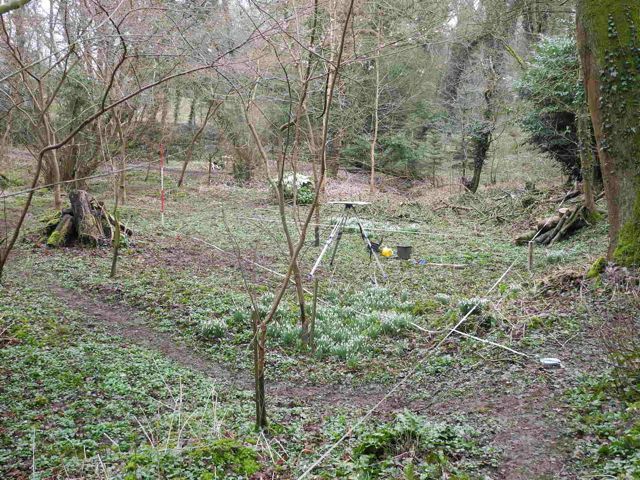 Back in business after a partial recovery from my cold and still having to put up with poor weather, the survey of Mesopotamia was completed and drawn up before we embarked on a further push to clear the site of the House of Diversion... what fun we had! Many thanks to Kathryn, Naomi and Joe for helping out. Joe made a significant find lying loose amongst the pine needles, a rather fine glazed floor tile, almost certainly of the seventeenth century. The weather was almost nice for a moment or two... then it started snowing again! a base line set out along the length of the Cascade. of the tumbled rubble north of the Bath becomes clearer. 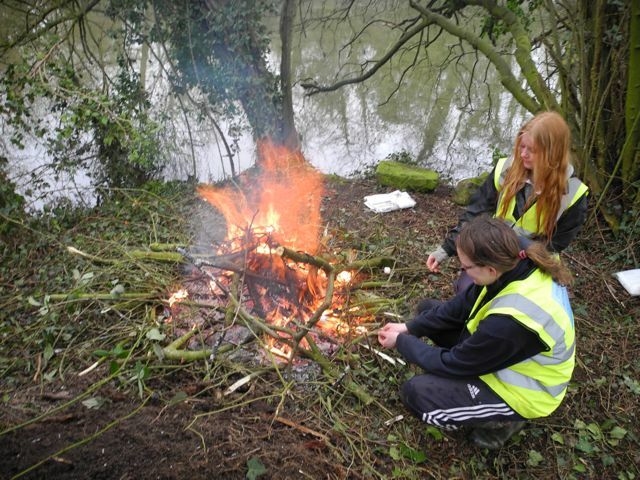 Having fun: weeding, weeding, weeding; getting the ferry back for lunch; roasting marshmallows by the fire-side! ... and it carried on snowing and then we got stuck in a rut, cold, cold cold, in fact the coldest March for 50 years! 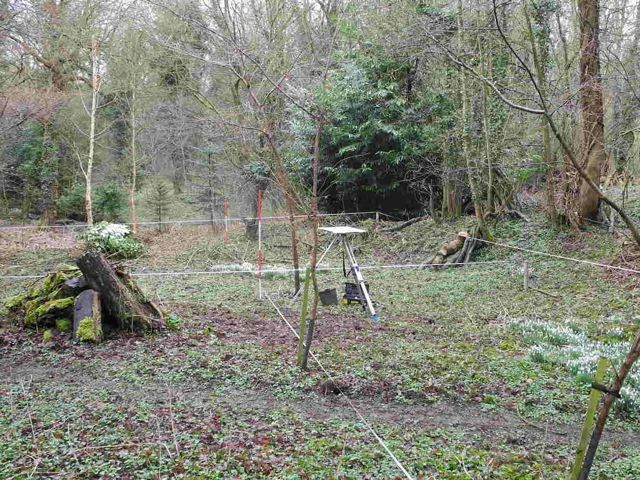 So going in to April there's still lots of survey work to do before the greenery takes over. During the clearance of the undergrowth over on the island a certain amount of leaf mould and topsoil came up too and lying rather crookedly, and quite alone, within it was this tile. Clearly hand made, it is roughly 110 mm square, 20 mm thick and weighs 532g. The upper face, on the left, is quite worn but retains traces of a yellow glaze, an effect achieved over a thin coating of white slip. 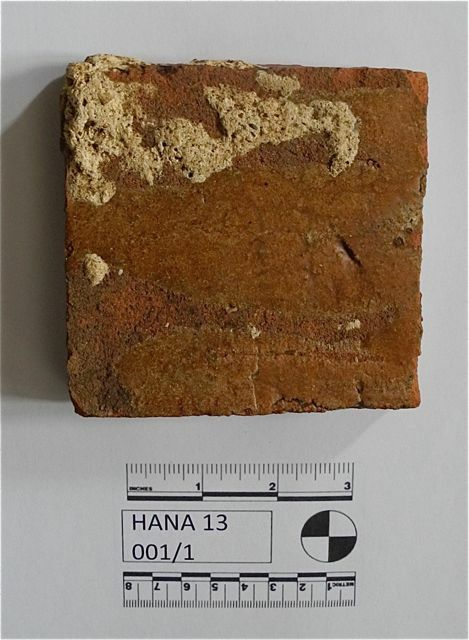 The rear face as well as having some remnants of the white lime mortar it was bedded in also has two extensive smears of a light treacley brown glaze presumably run off from a process whereby the face of the tile is dipped in the glaze but in this case an excess ran down the back. 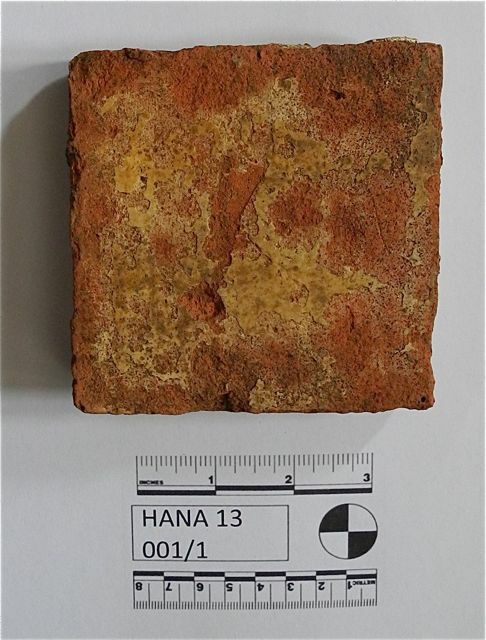 I would be happy to see this tile in a medieval context but equally there is no reason why a plain yellow tile with these dimensions shouldn't be seen in the seventeenth century. 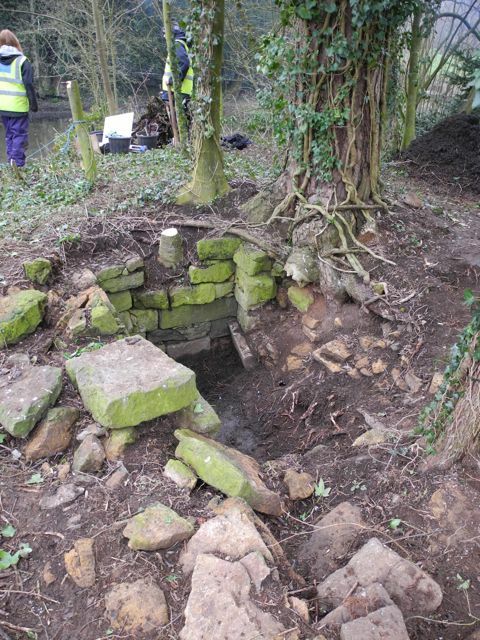 Apart from the existing stonework this is the first evidence we have for structures associated with the House of Diversion. Thanks to Joe for the discovery.